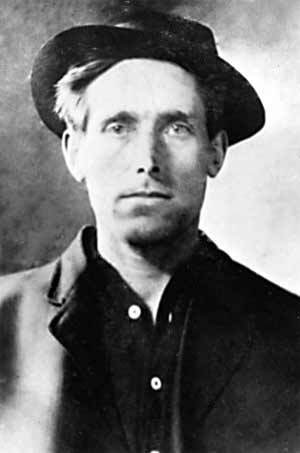 Joe Hill was executed by the State of Utah on the 19th November 1915. Born Joel Hagglund in Gävle in Sweden on October 7th 1879,he went to America in 1902 and used the name Joe Hillstrom, which he shortened to Joe Hill. His trial for the murder of John G. Morrison and his son Arling a Salt Lake City grocer became a national event. His subsequent conviction aroused a huge campaign to save him, Helen Keller lent her support,even President Woodrow Wilson made two unsuccessful interventions to save him from the firing squad to no avail. His supporters believe he was executed solely for his union activities, following an unfair trial, the State authorities denied this. 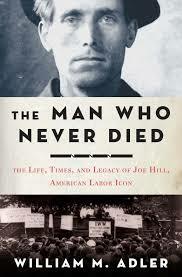 Joe Hill refused to cooperate with the trial and would not explain a bullet wound he had when he was arrested. It subsequently transpired that Joe was wounded following a confrontation with a rival, a fellow Swede, Otto Appelquist for the attentions of Hilda Erickson. William M. Adler in a recent book The Man Who Never Died (Published by Bloomsbury 2011) named the most likely murderer of the Morrisons, a man the authorities had earlier arrested but subsequently released. Why did Hill not explain how and why he was wounded, which would have provided the alibi required? Would it have mattered anyway as the authorities seemed hell bent on attacking the Wobblies? Did he come to believe that he was freer in death as a hero and a martyr rather than continue a life as an impoverished labourer? The arguments have gone on for a hundred years. His principled if perhaps reckless stand has been long debated in union circles. “Big Jim” Larkin gave the final oration over Joe Hill’s grave and read from the letter Hill sent to his friend Elizabeth Gurley Flynn who had led the campaign to free him (even visiting the White House!). Larkin urged those present to ensure that “his blood should cement the many divided sections” of the Labour movement. Alfred Hayes wrote and Eric Robinson put music to the Ballad of Joe Hill in 1936 and Paul Robeson performed it in Carnegie Hall. Joan Baez sang it at Woodstock in 1969. Joe Hill has inspired generations of singers;from Guthrie to Dylan, from Utah Philips to Billy Bragg, from Anne Feeney to Si Kahn…….Joe Hill lives on “where workingmen are out on strike, Joe Hill is at their side”. Here in Ireland Luke Kelly is well remembered for his version. Joe Hill wrote some very important songs himself. 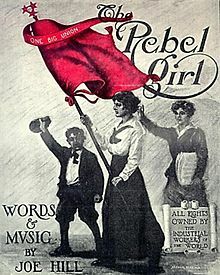 He was one of an IWW group of songwriters and poets such as Ralph Chapin (Solidarity Forever) and Jim Connell (The Red Flag) who contributed to the Little Red Song Book. His best known song is the “Preacher and the Slave” from which the phrase “pie in the sky” originates, sung to the tune of “Sweet Bye and Bye”. He wrote “The Rebel Girl” for Elizabeth Gurley Flynn, while another of his compositions “Casey Jones – the Union Scab”quickly became a favourite among striking railroad men. “The Tramp” resonates with the thud of aimless walking and despair of unemployment, while “Down in the Old Dark Mill” contrasts a lost fleeting Mill romance with the brutal lasting consequences of a factory injury. His own father had died following an industrial accident involving a train when Joel was 8 years old. During the Spirit of Mother Jones Festival 2015, we hope to commemorate the life, death and the legacy of the songs of Joe Hill as we approach the 100th anniversary of his execution. All are welcome to participate with a Joe Hill or union song on Saturday night 1st August from 9pm.